So, here are six Snoopy-themed Christmas/Winter's Day greetings cards for use with MogHughson's Postal System. If you download these cards along with MogHughson's Postal System, then your sims will be able to send these cards to their friends, relatives and acquaintances in the neighbourhood. Sims who receive these cards will receive a small positive boost to their friendship level with the sender. The cards feature various Snoopy images, all of which relate to Christmas. There are two sets of cards, one of which is for Christmas and the other of which is for Winter's Day (which is featured on Phaenoh's calendars, like here). The two sets share the same GUID's, so you can only have one set in your game! There is only one difference between these sets, as none of the card images include text. The greetings message that pops up when your sim reads the card is different: in the Christmas set it reads "Merry Christmas! Wishing you a very Merry Christmas!" and in the Winter's Day set it reads "Merry Winter's Day! Wishing you a very Merry Winter's Day!". All of the package files are numbered according to the above pictures, so you can delete any of the cards that you don't want in your game. Don't forget that you can only have one set of cards in your game! (Or, more accurately, one version of each numbered card - you could have 1, 3 & 4 from the Christmas set and 2, 5 & 6 from the Winter's Day set, for example, but I don't know why anyone would want to! :-D). 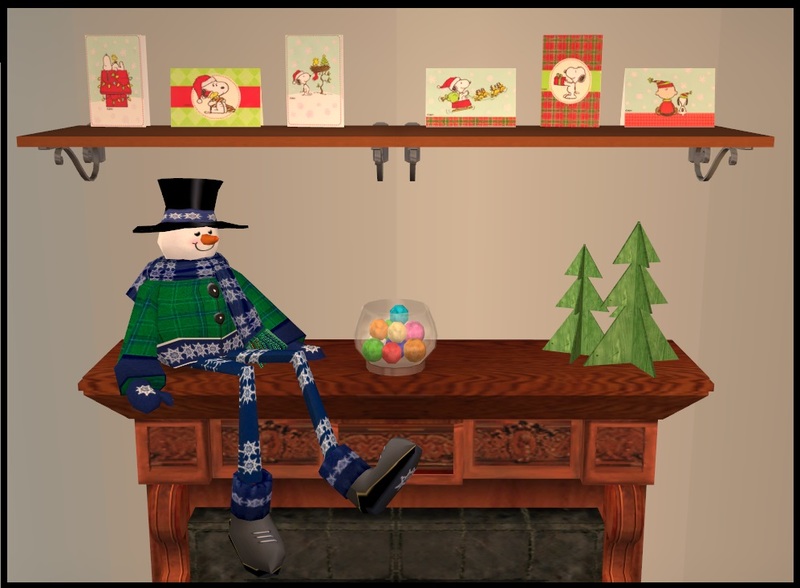 Thank you to Honeywell, Macarossi, Mustluvcatz and HChangeri for the shelves and Christmas decorations shown in the main picture. Thanks (as always) to the makers of SimPE. Snoopy Cards - Christmas.rar | Description: Lauratje86&#039;s Snoopy Cards - Christmas. Snoopy Cards - Winter's Day.rar | Description: Lauratje86&#039;s Snoopy Cards - Winter&#039;s Day.